Both sides are going to need to make concessions. The majority of Japanese are skeptical about the chances of complete, verifiable and irreversible dismantlement (CVID) in North Korea, this year’s Singapore summit between North Korean leader Kim Jong Un and U.S. President Donald J. Trump notwithstanding. Japan has painful memories of being deceived by North Korea over the abduction issue, as well as the nuclear missile issue. In 2002, Prime Minister Junichiro Koizumi met with Kim Jong Un’s father, Kim Jong Il, and got both an admission that North Korea had indeed snatched Japanese citizens and an apology. Five Japanese survivors were successfully returned to Japan, but sixteen years have passed since then without any significant evidence about the other, presumably deceased, victims. Japanese mistrust of North Korea is even deeper than neighboring countries can imagine. Among Japanese researchers, however, opinions about denuclearization are split. Those researchers who specialize in security and international relations studies contend that North Korea will never give up nuclear weapons, and that it is merely attempting to buy time to ward off a U.S. attack. In contrast, those researchers (including me) who analyze the tone of the North Korean argument think that North Korea has made its decision on denuclearization dependent on the moves that Washington makes. The idea that North Korea will never give up the nuclear weapons and missiles that it has spent so much time and money accumulating can be very much attributed to the Japanese artisan spirit. The U.S. and Chinese businesslike attitude of parting with technologies and companies inherited from previous generations if they can be sold for the right price is hard for Japanese to understand. Many people around the world migrate to other countries in search of better lives and educational environments, even if their current situation is not critical. But Japanese rarely think that way. Kim Jong Un is more of a pragmatist. Not only did he suddenly execute Jang Song-thaek, Vice Chairman of the National Defense Commission, who was also his uncle and closest aide, he has made numerous other changes to his entourage. At the Supreme People’s Assembly, Kim makes sure that its members not only present positive outcomes, but that they also speak up about problems without fail. Kim is known to act without warning to gain insight into the realities of the domestic economy. It seems quite likely that he has examined the advantages and disadvantages of retaining nuclear weapons for decades to come. Yet the top leader’s decision does not always translate into the right choice for North Korea. Kim Jong Il apologized for the abductions of Japanese citizens, but the chances of a normalization of diplomatic relations between Japan and North Korea, the desired goal, dimmed. Security experts tend to think rationally due to the nature of their specialty. Their argument that North Korea will never give up nuclear weapons and missiles as a deterrent to the United States is not incomprehensible, but it cannot be said that North Korea’s top leader always makes rational judgments. Compared to the time of the first nuclear crisis and the six-party talks, there are some crucial differences now. It is often pointed out that things move through summit diplomacy today. Direct negotiations with the top leader are the only way of pushing North Korea to make a bold policy shift. It is worth noting that the North Korean domestic media, including Rodong Sinmun, mention the desire for CVID. Kim Jong-un made public the full text of the agreement that the North Korean leader made with the U.S. and South Korean presidents and also declared the conclusion of the Byungjin line of carrying on economic construction and nuclear development at the same time. Kim also ordered that “American Empire,” a phrase that had been used consistently for more than half a century, no longer be used. If North Korea continues to make no progress, there is little hope that economic sanctions will be lifted, let alone that diplomatic relations with the United States will be normalized. In this situation, the path to advanced growth that Kim has shown the nation will be closed. The North Korean side will not be allowed to get away with just conveying the impression that denuclearization is progressing, just as Trump won’t get far just giving the impression that his administration is implementing policies. But it is not that North Korea is proceeding unilaterally with denuclearization. Much depends on how the United States reacts, and now Kim wants U.S. concessions that will enable him to publicly trumpet the results. As long as the North Korea considers the Korean War a “U.S. invasion,” an end-of-war declaration means that North Korea would win a U.S. surrender, which can be explained as a motive for denuclearization. It is, so to speak, a matter of face. But the Trump administration listened to Japan, which is extremely concerned about the end-of-war declaration, and also suspected that China was behind North Korea, which resulted in the U.S.-North Korea deadlock. 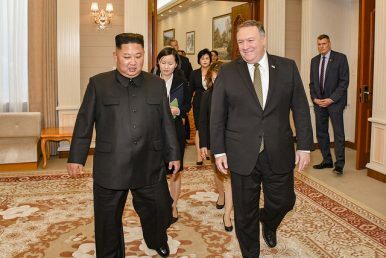 The North Korean side also has a deep-seated mistrust of the United States, and shows no signs of releasing a list outlining its nuclear development program. Pyongyang is vigilant about the fact that even if it reports the list honestly, if it contradicts U.S. intelligence, North Korea will be accused of lying. I have also heard that North Korea felt that although it made a concession to Japan over the abduction issue, it ultimately failed to gain anything, and sees this as a lesson to be learned. The extreme mutual mistrust between the U.S. and North Korea obstructs denuclearization. The only way of breaking the current stalemate is to break the previous agreement into component parts at a second U.S.-North Korea Summit. In a unitary society where policies are not allowed to be interpreted in an original way, all but the top leader are forced to be conservative. It is essential for the two leaders to make mutual concessions about a specific roadmap for denuclearization, while creating a timetable.